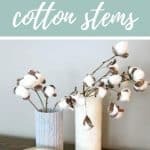 I love cotton stems with farmhouse style, but they can be kind of spendy. 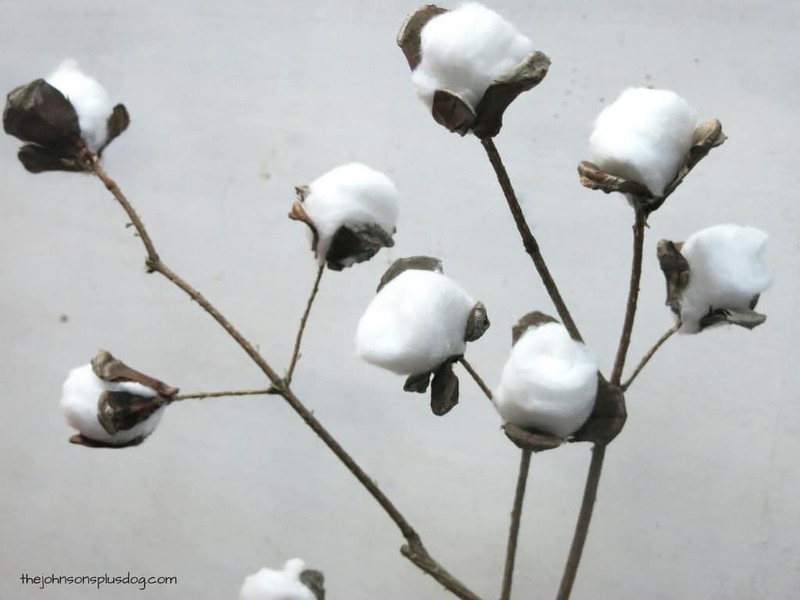 These DIY cottons stems can be made for less than $2 using cotton balls and pine cones. I love changing the house over to winter from Christmas. All of the fun and festive Christmas decorations are so fun, but usually by the time NYE rolls around I’m more than ready to get the house cleaned up. I love keeping things simple, but special in the winter. I like to have some special decorations so the house doesn’t feel too bare after the Christmas spirit gets packed up. 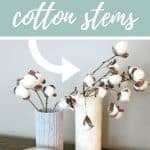 These DIY Cottons Stems are just that special & simple. Wanna know my favorite part? They can be made for LESS THAN $2! 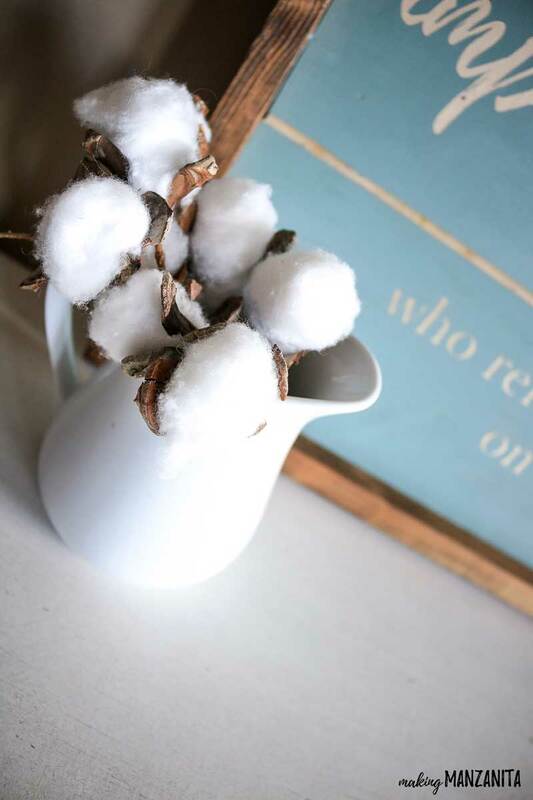 Thes faux cotton stems are perfect for your farmhouse style winter decor. Really they can be used all year round! 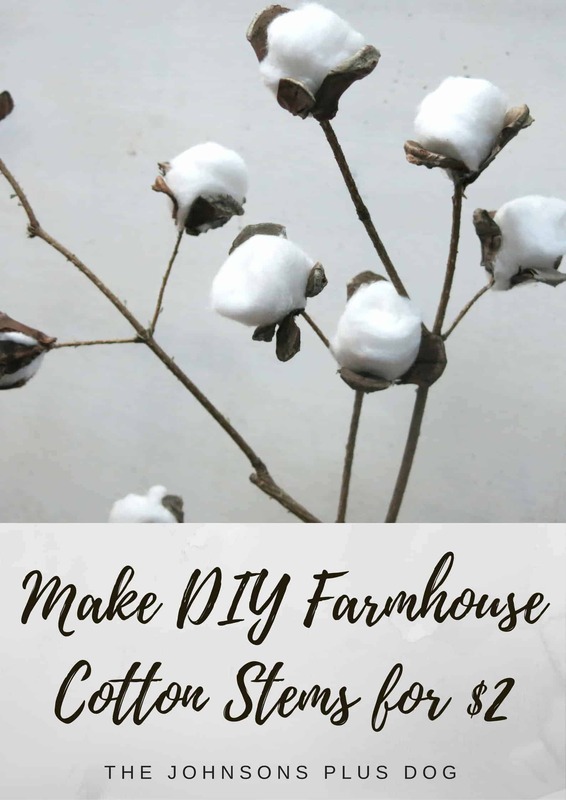 These DIY Farmhouse Cotton Stems can be made for seriously less than $2…aaaaand I’m totally rounding up there… I paid $1.18 for a bag of cotton balls and the rest of the supplies came straight from the good ol’ outdoors (minus hot glue… but, who doesn’t have a hot glue gun?!). These are a steal and couldn’t be easier to DIY. 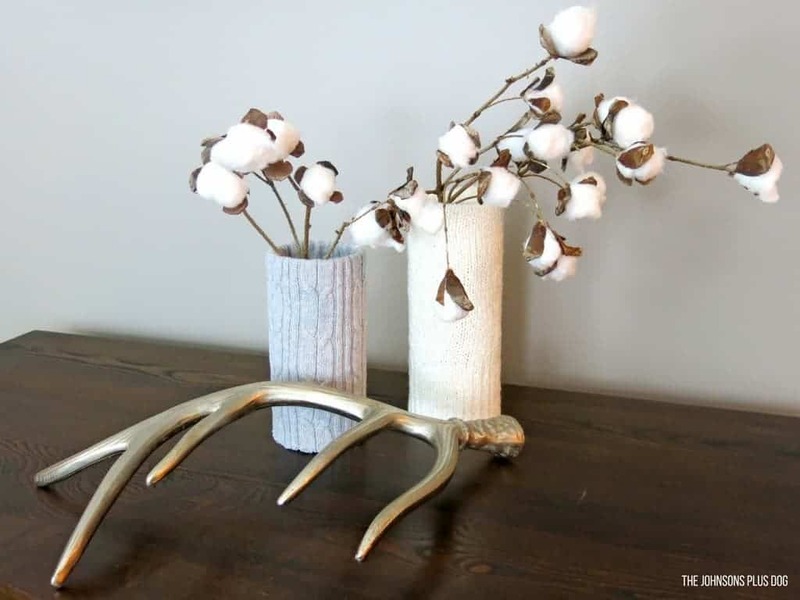 Even from discount craft stores, these trendy cotton stems sell for about $5 – $10 a piece. 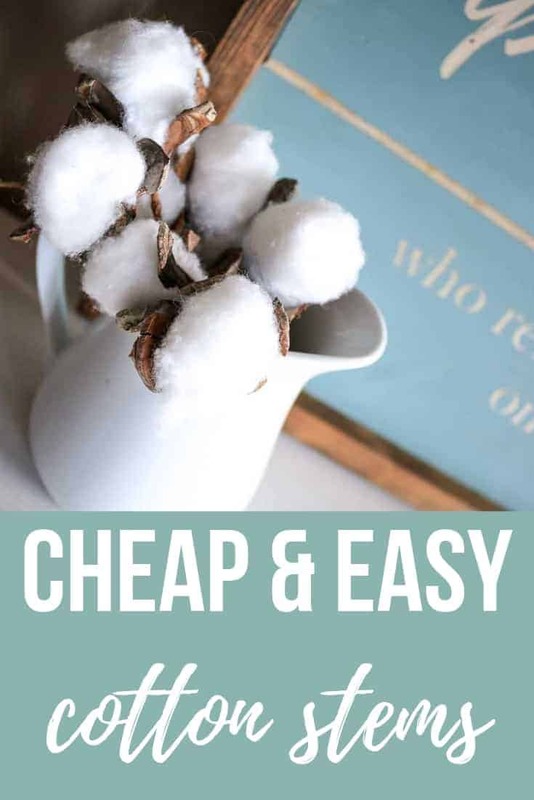 This cotton stems post contains affiliate links, but nothing that I wouldn’t wholeheartedly recommend anyway! Read my full disclosure here. Step 1. 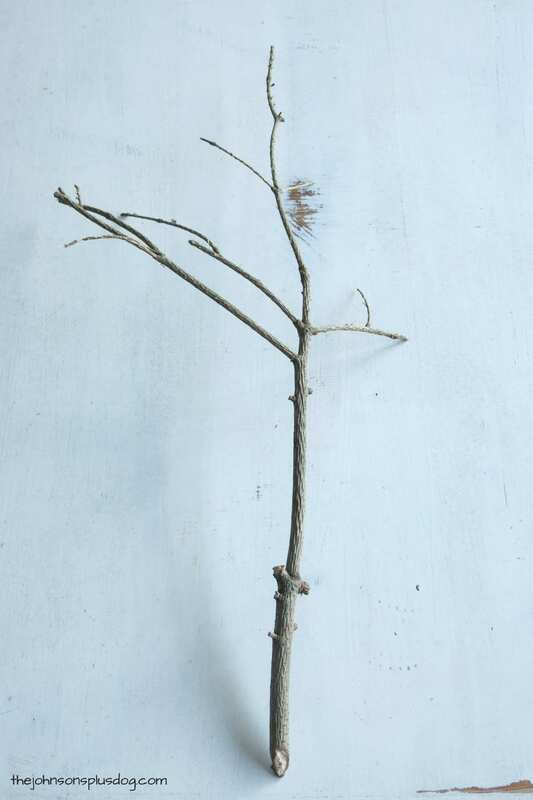 Remove greenery from twigs. First you need to take all the greenery off of the twig. Since all the twigs outside were covered in snow when I made this, I opted for taking some clippings from our Christmas tree before we threw it out. 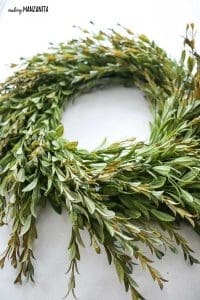 The greenery should peel off pretty easy, especially if your tree is REALLY dead like mine was, haha. Step 2. Remove pine cone pieces from cone. Next you’ll need to gently pull the pine cone pieces off the cone. Some pine cones will work better than others. Mine were really dried out because they had been inside for over a year used as decor. It may work easier if you take one fresh from outside. If your pine cone is really tough, you could always try ripping them off using some pliers. We used these when necessary. To clean the pine cones from outside, I usually run them under really hot water for about 30 seconds and then let them dry out for a day or two. You can also pop them in a pot of boiling water. UPDATE: I’ve gotten some other suggestions here too…Many people mentioned that they soak their pinecones in hot water for couple hours and then put them in the oven at 250 degrees for 30 minutes…besides drying it kills any tiny critters there may be. 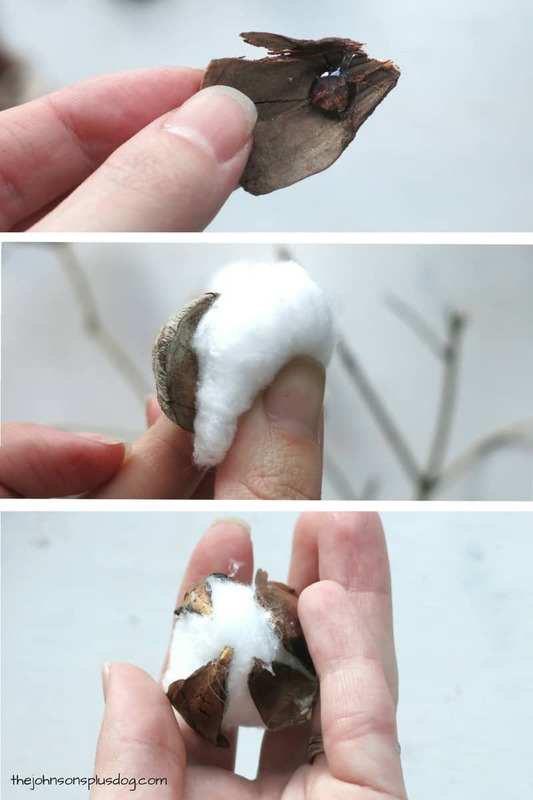 You’ll be using 3-4 pine cone pieces for each cotton ball you use. 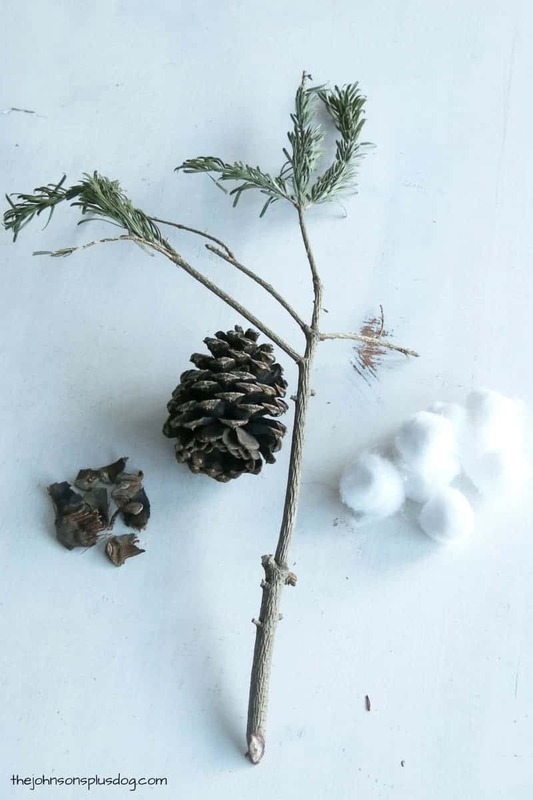 I attached a cotton ball to the end of every point on my twigs, so for the above twig I would be attaching about 9 cottons balls and would use about 36 pine cone pieces. Step 3. Glue pine cones pieces to cotton ball. Before I started gluing the pine cone pieces to the cotton ball, I rolled the cotton ball around in my hand a bit and pulled at it to make it look a little more natural and not so perfect. Next you’ll take your handy hot glue gun and put a small dab on the pine cone piece and press together on the cotton ball. You’ll attach between 3-4 pine cone pieces to the cotton ball, with all the points meeting in the middle with a little wiggle room. That’s where you’ll be gluing it on to the twig to make your cotton stems. Step 4. 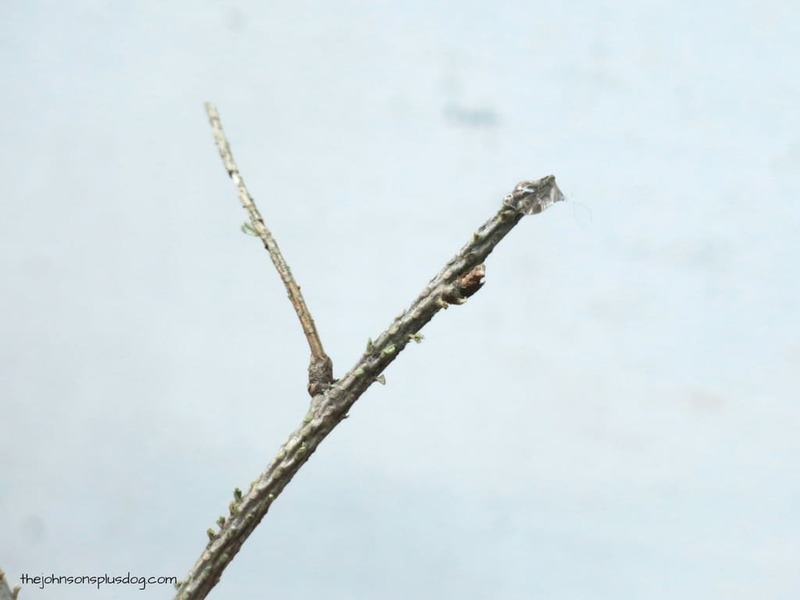 Glue onto twig. To attach the cotton to the twig, I just put a dab of hot glue on to the end of the twig and pressed the cotton ball on. 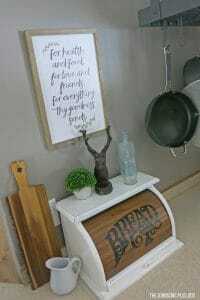 Repeat until all the of the ends on your twig are covered in this farmhouse perfection. Ta da!!!!! I told you that was easy! 🙂 I can’t wait to share the rest of my wintery crafts with you over the next couple of weeks. Hopefully I can help spark some inspiration to you as you change your homes over from Christmas decorations to winter. 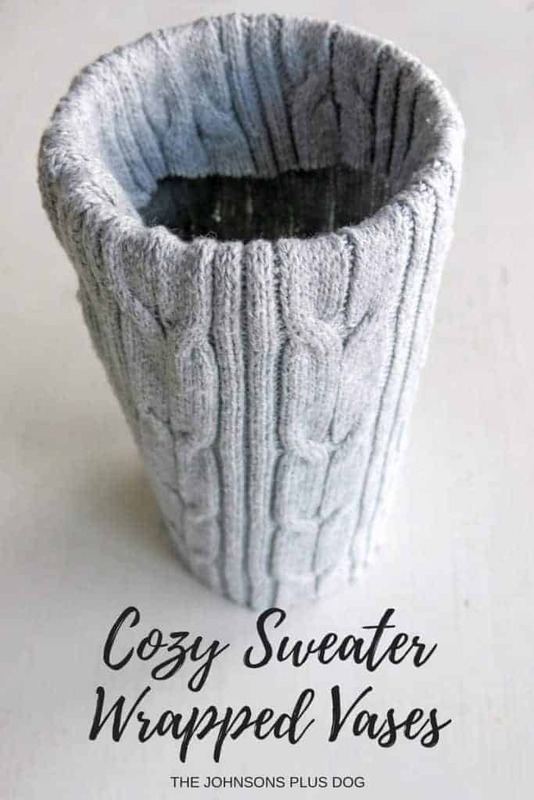 I think these DIY farmhouse cotton stems go great in the sweater wrapped vases I made – check out the full tutorial for those here. 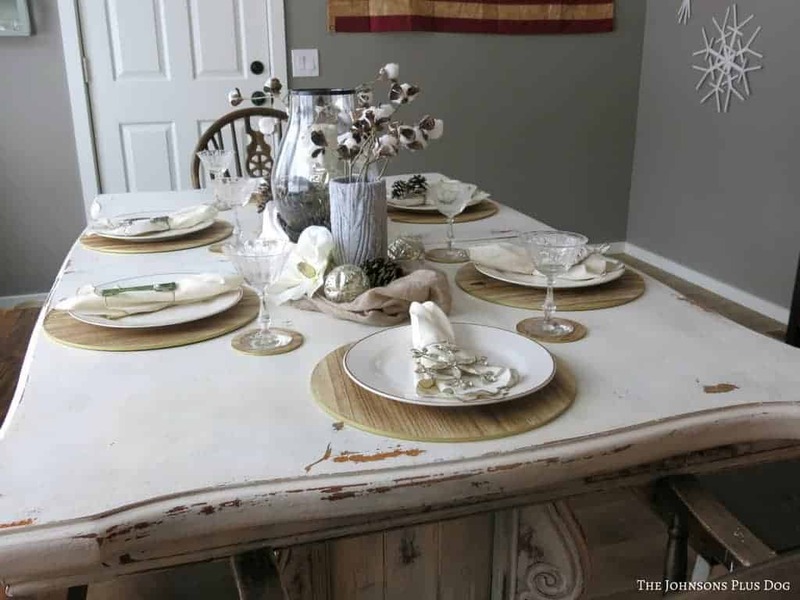 And on display in this farmhouse winter tablescape….learn more about the tablescape here. 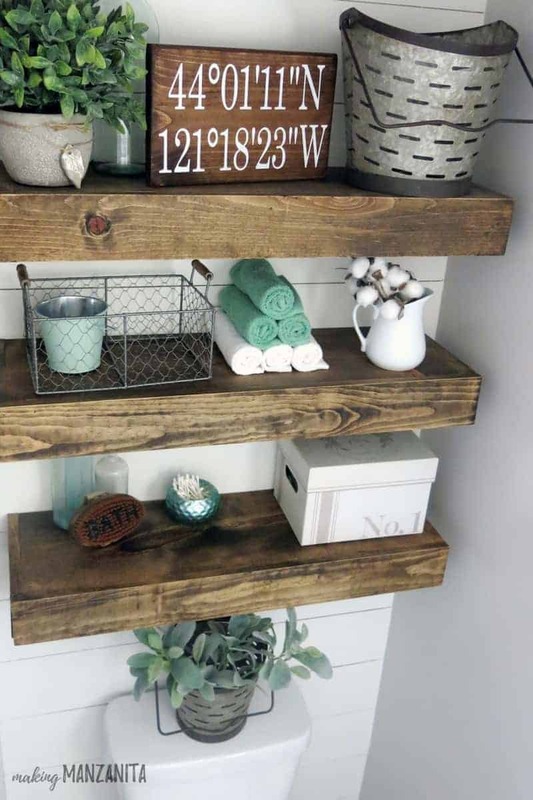 And decorating the bathroom floating shelves in our farmhouse master bathroom… learn more about the farmhouse master bathroom here. 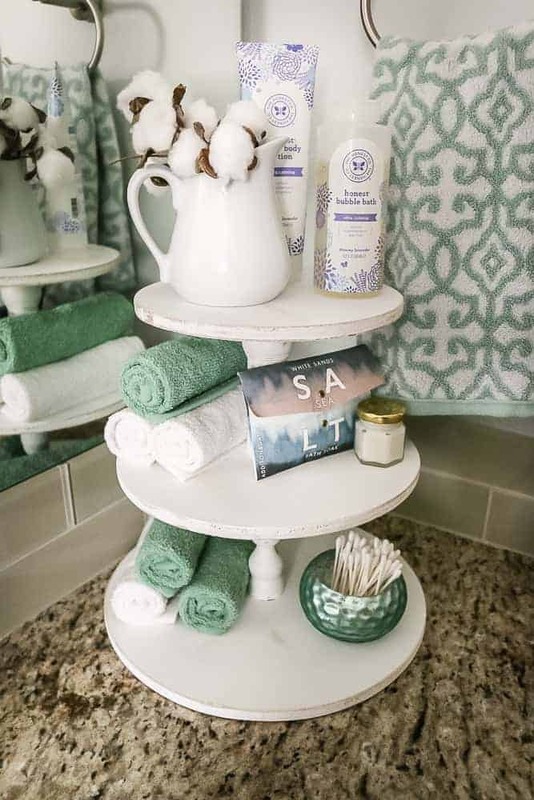 Here are the cotton stems on display on my tiered tray in our bathroom – learn how to make this three tiered tray here. I had a blast last month sharing how to make my homespun fabric Christmas ornaments on Hometalk’s Facebook page, which now has had almost 400k views… say WHAT?! Click here to watch the ornaments video. UPDATE: Here’s the winter crafts video in case you missed it!! If you love videos, be sure to check out my video page here or subscribe to my YouTube channel. What a cute idea! I love the idea of decorating for the season, as opposed to just Christmas! Well done! Before putting all the Christmas things away I start to bring out the snowmen, snowflakes, and white lights. I keep a pencil tree up all year round and it is decorated throughout the different seasons.